North Korean leader Kim Jong Un, left, inspects what the North claims is a thermonuclear warhead. At right is a test of a North Korean ballistic missile. Trump sees denuclearization as North Korea giving up its entire nuclear weapons program. What he would like from the on-off possibly on-again Singapore summit, White House National Security Adviser John Bolton told Fox News, is "the complete, verifiable and irreversible denuclearization of North Korea." Trump himself has allowed that may not be done in one fell swoop. Two days before declaring the June 12 Singapore summit was not going to happen, Trump was asked by a reporter if North Korea's denuclearization should be "all in one" or incremental. "It would certainly be better if it were all-in-one," Trump replied. "Does it have to be? I don't think I want to totally commit myself, but all-in-one would be a lot better." Many North Korea watchers doubt there is any possibility a North Korea denuclearization will happen all at once. "If you look back at the nuclear negotiations that we had with Iran and how long that took and how many times that almost fell apart," says Lindsey Ford, a former Asia policy adviser at the Pentagon, "it gives you a sense of the degree of difficulty actually trying to roll back a nuclear program." Ford, who's currently director of political-security affairs at the Asia Society Policy Institute, notes that unlike North Korea, Iran did not even possess nuclear weapons. 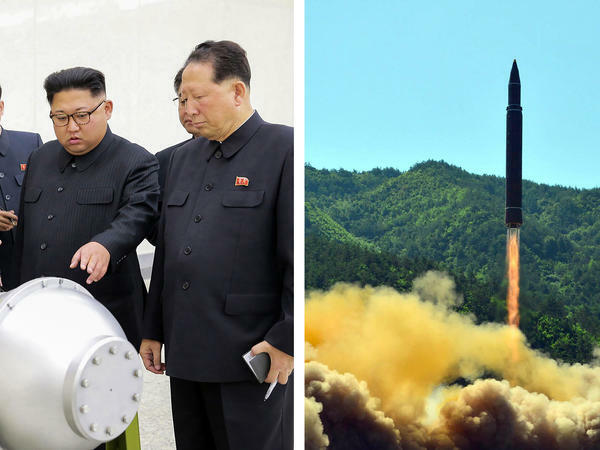 Step one for any denuclearization effort, according to Stimson Center senior fellow and 38 North website founder Joel Wit, would be removing the key elements of North Korea's nuclear arms. "The weapons themselves, the materials associated with the weapons, which can be the actual nuclear material in the weapons and their non-nuclear components, " says this former State Department coordinator for implementing the 1994 nuclear accord with Pyongyang, "all of that has to leave North Korea." Only North Korea knows for sure how many weapons it has and where they are kept. Still, Stanford University nuclear weapons expert Siegfried Hecker — the last American scientist to have seen North Korea's nuclear facilities from the inside — says some things are known about North Korea's stocks of plutonium, a man-made fissile material used in the relatively small nuclear warheads required for mounting on missiles. Hecker, who's visited North Korea seven times, says he has "great confidence" in estimates of how much plutonium North Korea could have produced and how much it has today, "and that ranges in 20 to 40 kilograms — and it takes on the order of maybe five or six kilograms to make a bomb." That would account for, at the most, eight nuclear weapons. Hecker says other evidence indicates North Korea may have 25 to 30 atomic bombs in all. "Could they have an overall bomb program that's ten times as large? No," says the former director of the Los Alamos National Laboratory. "Could they have one that's twice as large as what we think? The answer is possibly." Beyond those bombs, notes the Stimson Center's Wit, there's also the infrastructure associated both with the production of nuclear weapons and with research and development. "All of that," he says, "would have to be identified and eventually dismantled." Identifying what's been part of a program cloaked in secrecy could prove a real challenge. North Korea has revealed little about its nuclear program to outsiders. One exception has been Stanford's Hecker. He recalls that during his last visit to North Korea in 2010, his hosts made a point of showing him around a cutting-edge uranium enrichment facility that appeared not to have been detected by spy satellites. The needling message the North Koreans were sending by letting him inspect the facility, Hecker says, was, "We've done it in a building, you guys had no idea that we were doing it in this building. There may be other buildings like that." That's not exactly how they said it, he adds, "but that was certainly my sense — they have other buildings and we don't know where they are." Which suggests North Korea could simply hide what it wants to keep. "The North Koreans are very good at tunneling and putting things below ground, a lesson they learned from the Korean War when they were bombed heavily," Terry Roehrig of the U.S. Naval War College says, offering his own view of Pyongyang's aims. "So they have buried a lot of facilities." It's not just those facilities that will have to be dealt with. "There are going to be folks still in North Korea who know and could restart this type of program covertly if they wanted to," says the Asia Society's Ford. Removing that nuclear brain trust from North Korea would likely be far harder than relocating their work product. "You can't be absurd and ask for 10,000 scientists to be shipped out," says Wit. "You could ask for them to be redirected into civilian work — and have some assurance that that's working by having an on-the-ground presence to make sure that's what they're doing." What that means, says Stanford's Hecker, is North Korea would have to give outside inspectors unfettered access to its entire nuclear program - and facilitate that access. "Without cooperation from the North Korean side to prove that you have eliminated not only the nuclear weapons, the nuclear bomb fuels and the missiles," he adds, "it is essentially an almost impossible job." In a plan for denuclearizing North Korea that Hecker and two of his Stanford colleagues published this week, ridding that nation of its nuclear weapons program is projected to take up to a decade or more. "Considering the fact that it's taken at least 25 years to really put this nuclear arsenal in place," says Hecker, "the thought of turning it around and denuclearizing, so to speak, in a short period of time of a year or two is simply not possible." As a possible summit approaches between President Trump and North Korea's leader, a poem that kids learn in school comes to mind. The poem says, in its entirety, so much depends upon a red wheelbarrow glazed with rainwater beside the white chickens. For North Korea, we just have to revise this poem a bit. So much depends upon the meaning of a single word that is relatively hard to pronounce, denuclearization. Not very poetic but for the United States, that word means North Korea surrendering its entire nuclear program quickly. Those who know that program say quickly could mean years. Here's NPR's David Welna. DAVID WELNA, BYLINE: What President Trump would like from a Singapore summit, as his National Security Adviser John Bolton told Fox News, is nothing less than this. JOHN BOLTON: The complete verifiable and irreversible denuclearization of North Korea. WELNA: Trump himself has allowed that may not be done in one fell swoop. PRESIDENT DONALD TRUMP: It would certainly be better if it were all in one. Does it have to be? I don't think I want to totally commit myself, but all in one would be a lot better. WELNA: Lindsey Ford says all in one is simply a fantasy. A former senior Asia adviser at the Pentagon who's now with the Asia Society, Ford says even if North Korea were willing to denuclearize, which she doubts is the case, it would take years. LINDSEY FORD: If you look back at the nuclear negotiations that we had with Iran and how long that took and how many times that almost fell apart, and Iran was not anywhere nearly as far along as where North Korea is, it gives you a sense of the degree of difficulty actually trying to roll back a nuclear program. JOEL WIT: The weapons themselves, the materials associated with the weapons, which can be the actual nuclear material in the weapons, and their non-nuclear components, all of that has to leave North Korea. WELNA: But only North Korea knows for sure how many weapons are there and where they're kept. Stanford nuclear weapons expert Siegfried Hecker is the last American scientist to have seen North Korea's nuclear facilities from the inside. SIEGFRIED HECKER: I have great confidence that we have a good idea as to how much plutonium they could have produced and that they have today. And that range is in 20 to 40 kilograms. And it takes on the order of maybe five or six kilograms to make a bomb. WELNA: That would only account for at the most eight nuclear weapons. Hecker, speaking via Skype, says his best guess based on other evidence is that North Korea has at least 25 in its arsenal. HECKER: Could they have an overall bomb program that's 10 times as large? No. Could they have one that's twice as large as what we think? The answer is possibly. WIT: The infrastructure associated with the production of nuclear weapons and research and development. All that would have to be identified and eventually dismantled. WELNA: Identifying it could be a real challenge. Stanford's Hecker recalls that during his last visit to North Korea eight years ago, his host made a point of taking him inside a previously unknown uranium enrichment facility. HECKER: We've done it in a building, you guys had no idea that we were doing it in this building. There may be other buildings like that. Now, they didn't say it that way but that was certainly my sense. They have other buildings and we don't know where they are. WELNA: Terry Roehrig of the U.S. Naval War College says his own view is that North Korea could simply hide what it wants to keep. TERRY ROEHRIG: The North Koreans are very good at tunneling and putting things below ground, a lesson they learned from the Korean War when they were bombed heavily. So they have buried a lot of facilities. WELNA: And it's not just those facilities that matter, says the Asia Society's Ford. FORD: There are going to be folks still in North Korea who know and could restart this type of program covertly if they wanted to. WELNA: Removing that nuclear brain trust from North Korea, says former diplomat Wit, quite simply, is not an option. WIT: You can't be absurd and ask for 10,000 scientists to be shipped out. You could ask for them to be redirected into civilian work and have some assurance that that's working by having an on-the-ground presence to make sure that's what they're doing. WELNA: Stanford's Hecker says even if North Korea agrees to abandon its nuclear program, that would be an enormous undertaking. HECKER: Considering the fact that it's taken at least 25 years to really put this nuclear arsenal in place, the thought of turning it around and denuclearizing, so to speak, in a short period of time of a year or two is simply not possible. WELNA: In a just-published report, Hecker estimates it could take a decade to denuclearize North Korea. David Welna, NPR News, Washington. Transcript provided by NPR, Copyright NPR.